Android owns almost half of the cell phone industry, right? So, of course, that means that the same number of people are running on the same OS. And it gives rise to a lot of problems on Android, well that's what this piece is going to solve for you. 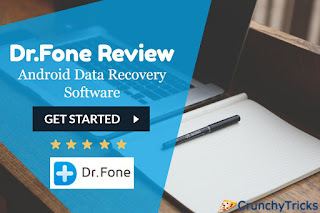 I won't lie, this one's going to be a review, I'm reviewing Dr. Fone For Android in this one. And trust me, this app took me by the nerves when I first launched it. The kind of options it showed to me, I was like: - That's possible too? As the name suggests, it's the Dr. of your Android cell phones! Meaning well just like humans cell devices get sick too, right? 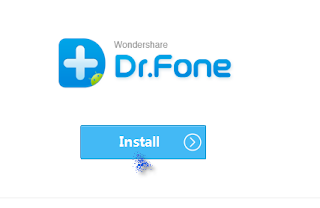 Quite enough problems with them, and that's what Dr. Fone cures. Data Recovery- Photos, Videos and EVEN Call Logs. Hey! Excited already? Navigate to their Homepage to get a better glimpse of what they're offering! Once you get the file downloaded. Tap the icon and then click on the Install button! And then, just click the Start now Button! Done! Yeah, now you explore the possibilities without restrictions! So hey! I might not be able to list out and explain all the features (cause trust me, that's a long, long list!) But I'll still try to cover as many as possible out here for you. The Data Recovery option (that also has one of the "highest" recovery rates in the industry!) is the first choice on the dashboard. 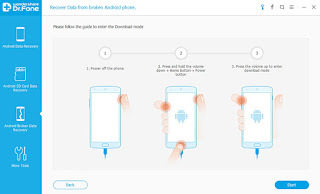 Just click on it, and connect your device via USB! Once you do, you'd see that it offers you a WIDE range of stuff that can be recovered! 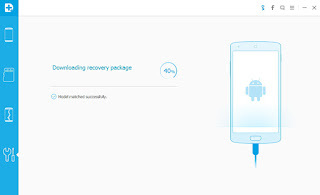 So basically, just select the stuff you want to be recovered, and click on next! And then, well you'd see all the data that it can improve on the next screen, with the "types" broken down on the left-hand side. 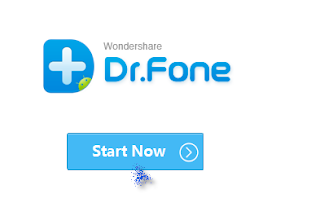 Well, I know that's a lot of data, but that's what Dr. Fone is capable of. Can't blame it, right? 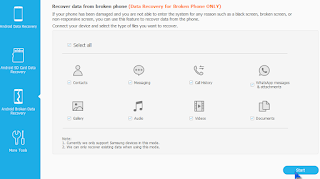 So now, just select the data you want to be recovered, and click on Recover. 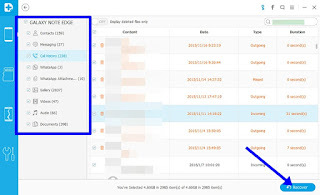 What Kind of Lost Data Can be Recovered? Yeah, a legit question, right? I mean, can your data be recovered if you deleted it? Or maybe you lost if when your system crashed? Or if you forgot your password? What if I tell you, you can recover ALL of those types, and even more! So see? They aren't leaving any stone unturned! 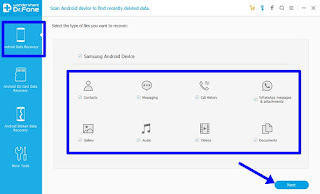 Well, this feature owes it's uniqueness to getting you your data even when your cell phone isn't exactly co-operating. I mean many times, our cell screens get cracked! Or the device stops responding. Now resetting it will just result in us losing every piece of data on the device, right? So well you won't anymore. So in short, this option helps you out when you can't get your cell phone to co-operate. 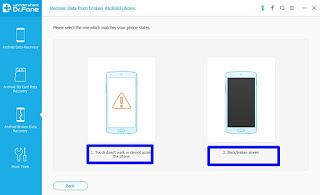 So well, just click on the "Broken Android Device" button and select the type of files you want back. 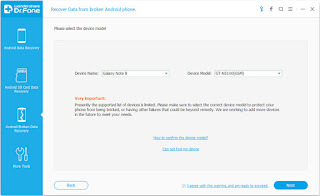 Once you've done that, select your device from a drop-down list! 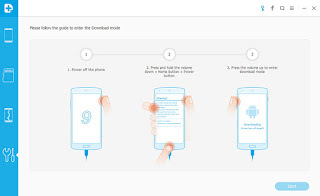 Now, the screen would prompt you to enter the "download mode" so that the Doc can download stuff off your device. Well, you'll know what you've to do because the screen tells you so. You get a step by step process; that's explained via images about what you've to do. So well just follow the instructions. After that, well your device would be analyzed, and then you'd be taken to the data that can be recovered. And just like old times, click on the Recover button to retrieve the data. So hey, Pretty neat, huh? Not a lot of rocket science needed over here either. 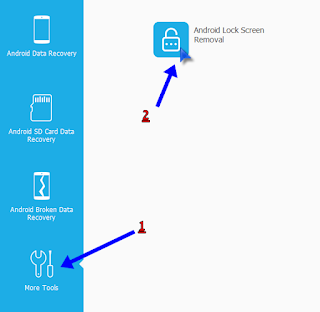 Just select the More Tools option, and then Android Lock Screen Removal button. Well on the next screen, just click Start and it will again prompt you to enter the Download mode by following the steps. Now, just wait till the recovery package is downloaded! Done! Well, you'd get a screen saying that the process was successful! So what exactly had you to do? Nothing, apart from waiting. Now that's an "easy hack" isn't it? Try it Free for 30 days or if you're willing to buy then simply order it from following link.